What is the YIELD Function? 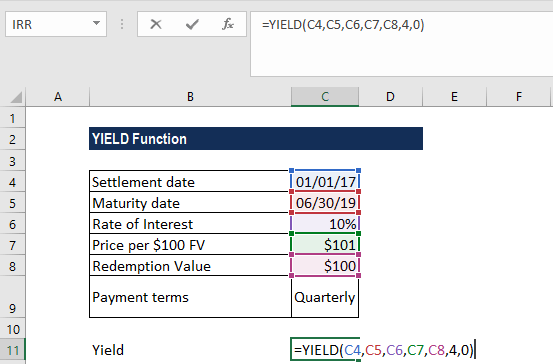 The YIELD Function is categorized under Financial functionsFunctionsList of the most important Excel functions for financial analysts. This cheat sheet covers 100s of functions that are critical to know as an Excel analyst. It will calculate the yield on a security that pays periodic interest. The function is generally used to calculate the bond yield. As a financial analystFinancial Analyst Job DescriptionSee a real Financial Analyst Job Description including all the skills, experience, and education required to be the successful candidate for the job. Perform financial forecasting, reporting, and operational metrics tracking, analyze financial data, create financial models, we often calculate the yield on a bond to determine the income that would be generated in a year. Yield is different from the rate of return as the latter return is the gain already earned while former is the prospective return. Maturity (required argument) – It is the maturity date of the security. It is the date when the security expires. Rate (required argument) – It is the annual coupon rate. 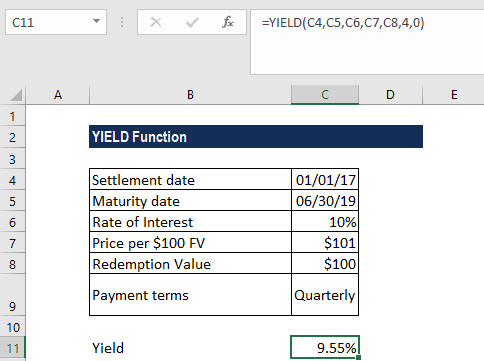 How to use the YIELD Function in Excel? We used as basis the US (NASD) 30/360 day basis. We provided invalid numbers for the rate, pr, redemption, frequency or [basis] arguments. That is, we provided rate < 0; pr ≤ 0; redemption ≤ 0; frequency is any number other than 1, 2 or 4; or [basis] is any number other than 0, 1, 2, 3 or 4. The settlement and maturity dates provided are not valid dates. The settlement date is the date a buyer purchases a coupon, such as a bond. The maturity date is the date when a coupon expires. For example, a 30-year bond is issued on January 1, 2010 and is purchased by a buyer six months later. The issue date would be January 1, 2010, the settlement date would be July 1, 2010, and the maturity date would be January 1, 2040, which is 30 years after the January 1, 2010 issue date.